The Foundation is a 501-c(3) nonprofit organization whose mission is to provide support to the initiatives of the Partnership. The Foundation is the home of the Meade Willis Revolving Loan Fund, which provides assistance to those wishing to open a retail or restaurant business downtown. For more information on the Foundation, contact Jason Thiel at 336-354-1500. 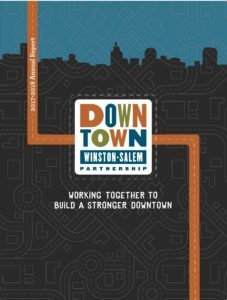 In 2011, the Downtown Winston-Salem Partnership produced the sixth annual Salute! North Caroline Wine Celebration, presented by BB&T. Thirty-two of North Carolina’s finest wineries and the over 8,500 attendees helped make Salute! a success in its sixth year. Winemaker Dinners on Thursday and Friday evening before and the offical Salute! AfterParty help complete the Salute weekend for local patrons and visitors alike. Salute! 2012 will take place on Saturday, June 2, 2012 along beautiful 4th Street. Hotel packages are available. For information on sponsorship, volunteering, ticket sales, or general info, contact the DWSP at 336-354-1500 or visit www.salutencwine.com . For the last 30 years, the Downtown Winston-Salem Partnership has produced Winston-Salem’s Annual City Tree Lighting Celebration. Typically held the first Saturday in the month of December in Corpening Plaza at the corner of First and Liberty Streets, the City Tree Lighting Celebration has become a highlight of the Holiday Season for young and old alike. For information on sponsorship, volunteering, or performing at the Tree Lighting Celebration, contact the DWSP at 336-354-1500. In 1998, the Summer Music Series program was created by the Downtown Winston-Salem Partnership in an effort to support revitalization efforts in Downtown Winston-Salem. In 2015, we embark on the 18th season and the three series, Downtown Live (formerly Alive After Five), Downtown Jazz and Summer On Trade. The concerts have been credited with a resurgence of new restaurants, retail and housing developments that are now underway in the Downtown core. The popular outdoor concerts bring live music to the streets and parks of Downtown on Thursday, Friday and Saturday from June through August. They have become a vital part of the fabric of the city, last year bringing ~50,000 people of all ages, cultures and backgrounds together in a spirit of celebration. Setting the festivals in the streets and parks of Downtown has provided a relaxed and safe atmosphere, and the locations also serve to showcase the architecture, shops, restaurants and galleries that are unique to Downtown Winston-Salem. For more information, visit www.dwsp.org/music. The 2nd Annual Downtown Winston-Salem TubaChristmas will be held on Friday, December 4, 2015 at First Presbyterian Contemporary Worship Center at 6pm. It will feature up to 50 tuba players playing classical Christmas Carols. The DWSP also purchases and decorates Christmas Tree that stands in Merschel Plaza each year to compliment the City Christmas Tree in Corpening Plaza. Luncheon in the Fall months with a guest speaker. Annual Meeting of the Downtown Winston-Salem Partnership Membership. Each year this meeting is held during breakfast hours with a free complimentary Breakfast Buffet and the Mayor presents the Annual Downtown Excellence Awards.